Dren gets real as the cat-and-mouse game of whether or not John will help Scorpius discover wormhole technology reaches an epic crescendo. Seriously, it’s epic. Just listen to that choir. As our last episode came to a close, John had been on the fence. On the one hand, he was dedicated to destroying wormhole technology and sabotaging Scorpius’ efforts to achieve it. On the other, the Scarrans are looming strong and the only way to rid the galaxy of them might be to make a friend of your enemy’s enemy and let the Peacekeepers have the weapon. John’s entire mission the last few season has been to keep wormholes out of Scorpius’ hands, but there is a very real possibility he’ll cave and make one of those “tough choices” you hear politicians speak about. Billions will be lost. Billions will be save. Which set of billions outweighs the other is the lingering question. But then Scorpius decides to play his trump card, to reveal that he’s discovered Earth and that if John doesn’t play along, the human will be forced to watch as his entire homeworld is eradicated. Here’s the problem: nobody puts Crichton in a corner. The fact that John has built quite a reputation among the cosmos for his crazy and highly destructive exploits has been well established by this point, so the last, absolute worst thing you can do when he’s already at the end of his rope is to give him a kick. Sure enough, he further cements his reputation when he decides it’s not enough to sabotage the research, he has to take the entire Command Carrier down with it. Which brings us to Crais. He initially seems to be going along with Crichton’s plan, but then he turns, selling out to Scorpius for the promise of being reinstated among the Peacekeepers and placed in charge of Project: Talyn. After the last two years of running from his past, lashing out in anger, settling into a somewhat zen attitude of galactic acceptance, and finally forging bonds with people to whom he was once the most hated man in the cosmos, he spins a 180 and throws them under the bus to return to a world where he’ll probably struggle as much to fit in as he does with his current spot. But ah-HA! There’s a twist! He’s pulling the double betrayal as this was all a gambit to throw Scorpius off the trail while Crais works towards the one and only option that will take out the carrier, the one choice that’s his alone to save the day and bring an end to all this terror. He’s going to step onto the bridge of Talyn and ask the ship to go out with him in a final blaze of glory as they starburst inside the Carrier, causing it to collapse in on itself. And that’s what they do, with the blessing of John, of Aeryn, of even Moya herself, who’s finally willing to let her son go if doing so lets the broken boy finally become a hero. I have to be honest, I forgot these events played out at this point in the series. To show you how bad my memory is, I mixed this up with the events of The Peacekeeper Wars and recalled them as the same story. Crais and Talyn having their final goodbyes. An entire Carrier going down with belching flames and people screaming as they rush to whatever escape they can find, their entire life, their home, their school, the symbol of their strength and discipline collapsing around them. The climactic moments of John and Scorpius staring at one another from opposite sides of a flaming abyss, circumstances having gone so far that neither has the energy left for hate or revenge. Maybe I mixed this up with the finale because, had the series been cancelled, this wouldn’t have been a bad note to end it on. Sure, there’s a few lingering threads (Grayza, Earth, Scarrans), but there is a genuine finality to the ending. The primary adversaries have reached the ultimate end-point of their confrontation and one very likely died as he calmly walked into the field of explosions swallowing his vessel. John destroyed the science database, wiped the memory of the only other scientist with enough knowhow to put the pieces together, yet is still lingering on his own desires as he slowly jots out the final pieces of the equation on both parchment and the bare skin of his arm. Crais and Talyn have reached the final ends of their arcs. Aeryn hasn’t fully settled with M’John, but they’re both alive and mourning together. And words is spreading among the rest of our crew that the time has once again come to think about going their separate ways and letting these events, instead of being their present drive, be the past they try to move on from. If the series had ended here, it would have been a fantastic bittersweet note to go out on. But it didn’t. Not only do we have another season, but this one isn’t even over as we still have one more episode to go. Obviously, my memory can’t be trusted, so I don’t have a clue how in the hell how they’re going to follow up this one with a finale that could be any more striking. But this is Farscape. It’s always chock full of surprises. Oh man oh man oh man. What you have right here, ladies and gentlemen, is the very pinnacle of Farscape. The height of heights, the be-all, the standard by which everything else must be judged. Let me tell you why. The curtain goes up with Scorpius and Crichton fighting over Earth, wormholes, and the bind everyone is in. Scorpius is losing control of the situation, his usual elegant solutions aren’t working, so he starts getting physical. He’s never been afraid to get his hands dirty (remember when he shot Gilina? ), but he’s always preferred psychological manipulation to brute force. That he feels forced to resort to it, and one precision invective with regard to Commandant Cleavage, shows how very desperate he’s getting. He’s flat out of time. When Grayza returns, his project is over. The last hope the Peacekeepers have to prevent Scarran invasion and gain Scorpius’ revenge against them will be finished. Naturally, being Scorpius, you know he’s got another couple plans percolating in the pot, but he’s got an awful lot invested in this one. The end of that conversation is absolutely perfect. Crichton bleeding from the mouth, two inches away from Scorpius, and he blows a kiss. Then he thumps his own head against the floor twice to hurt Scorpy through the bracelets. There are seven minutes of deleted scenes for this episode. One of them has Rygel farting to clear out the restorative mist chamber so it can be used for the Moya war council. Really, they do set up shop there and abandon every pretense of using it for the designed purpose. Everyone has to know that. I suspect that Scorpius allows it because he knows what happens when you put someone into an inescapable corner – given no choice, even the meekest Interion will put up a fight. Once upon a time, Furlow built a phase stabilizer. Fairly straightforward device, when attached to a vessel it allows the safe transit of unstable wormholes. Co-kura Strappa, lacking the data that Crichton had gathered on a previous expedition, built one into the very hull of the Command Carrier. They illustrate the difference between practical and theoretical work – Furlow threw together something that worked, while Strappa focused on the how and why. Unfortunately, in so doing, he made it impossible for Crichton and company to stop the wormhole project without destroying the Command Carrier. Thus, in true “infamous for making really stupid moves” fashion, they set about destroying the Command Carrier. In another set of deleted scenes, we see Chiana and Rygel conning information on the crew numbers and evacuation precautions from an unsuspecting lieutenant. Chi swoons gracefully, and the poor guy flusters all over her. Elsewhere, D’Argo cleaves into a Peacekeeper data core searching for information on the modifications Scorpius has made to facilitate the wormhole project. Jool is with him, and takes advantage of the unrestricted computer access to find star grids leading to an archaeological dig site that her people have been working at – essentially, her ticket home. Of course, Crais then betrays them to Scorpius, and all of this work comes to naught. Crais. Man, what an arc. From madman to kidnapper to reluctant ally to worthy opponent, he’s had a long and magnificent story. He burns his last bridge with Lieutenant Larell, backhanding her and telling her off in a very public place to ensure that she won’t go down with him. His final moments, from his speech to Talyn to his last words, are the perfect resolution. The only possible way he could go, showing that he truly did love Talyn and going out in a blaze of glory. That scene brings a tear to my eye every single time. There’s one more deleted scene that has a last exchange of words between Crais and Aeryn, him apologizing and her absolving him. The scene works without the dialog, a final moment of silent communication between two warriors with mutual respect. Crichton and Harvey go back and forth over how bad the situation is with Scorpius. The theme they have going remains in place, two soldiers near the front lines, reflects the state of Crichton’s mind while aboard the Carrier. And Harvey wins every game they play, that’s a bit ominous. In the process, Crichton learns how to zone his mind out and properly access his subconscious wormhole data. He realizes that he can complete the wormhole project, and that he doesn’t need a team to do it. His “I can do this” moment sounds a lot like the one the other Crichton had, if much quieter. Co-Kura Strappa. Poor guy. He’s a research scientist, pure and simple. His entire intent is to pursue the secrets of the universe for the sake of knowing, but he doesn’t quite comprehend that his work will be used for destructive purposes. Linfer may have understood it, and got away while she could, but Strappa is completely oblivious until Crichton rubs his nose in it. Then, faced with the choice realization that the knowledge he’s accumulated will be used to kill people, he voluntarily takes a seat in the Aurora Chair and wipes it out. It’s not a huge moment of heroism, as such things go, but the courage he shows is powerful. Scorpius gets his first taste of wormholes. The emotions on his face, first wariness and anticipation when Crichton makes the offer, the fear when the Farscape module starts to tumble, and the genuine peace when Crichton finds the sweet spot. He’s found what he’s looking for, and it’s within his grasp. He has, for these brief moments, everything he needs to complete his goals. Wormhole technology is his. And then it’s all taken away. Grayza no longer has to return for the project to be terminated, Crais has utterly destroyed it. His position in the Peacekeeper forces is now irreversibly damaged. His revenge against the Scarrans, the only thing he cares about, is lost to him. He wanders the ship for a time, watching his world crumble. Fire shoots from the ceiling, panels explode, water cascades down stairs, and he just stands there. Aeryn runs in to Henta again while directing personnel towards the escape pods. The confrontation is brief, and ended by a completely random exploding panel. Aeryn is once again reminded both that she is mortal, and that fate can kill anyone at any time. The final confrontation between Scorpius and Crichton is beautiful. Scorpius is broken, defeated, his tools destroyed and his purpose unfulfillable. Crichton beat him at his own game. Rather than lash out, instead of immediately swearing revenge and setting off for Earth or shooting Crichton, he gives up the iYensch I-Yensch bracelet code and wanders off, apparently to die. Then we have the final scenes. The band is breaking up. Crais and Talyn are dead. Chiana is hopping off on some random Commerce planet to head into Nebari space and join the Resistance. D’Argo is taking the Guppy (now with voice-control and autopilot) to find and kill Macton Tal, the man who murdered his wife. Rygel is heading back to Hyneria to incite and uprising against his cousin Bishan. Jool is heading to an archaeological site in the hopes that members of her species there can give her a ride home. Crichton and Aeryn have nowhere to go. Pilot and Moya will take Talyn’s remains to the Leviathan Sacred Space, and then they’ll have no crew and no destination. Where do things go from here? Finally, in the interest of ending on a non-depressing note, have the music from the episode. It is amazing. Crais has come a very long way since that first episode where he was the vengeful brother determined to hunt our protagonists down. Through all his changes, though, there’s always been at least an inkling of doubt between the characters and ourselves that the old Crais was still in there, somewhere, biding his time until his opportunity arose. Which is why, when that appears to be exactly what happens, we actually can believe it for the brief moment before we find out what really happened. I’ve been championing reformed Crais since back at the end of Season One, and even I bought into it for a second. I was horribly disappointed in him, but the idea wasn’t unbelievable. Of course, the true course of events is the complete opposite. Not only is he genuinely working to help the others, he’s doing it in about as selfless a way as he can. He and Talyn plan on sacrificing themselves to destroy the carrier in such a way that most of the people on board will be able to escape with their lives (realistically the only surefire way to bring that goal about). Let that sink in for a moment. They aren’t putting themselves in danger, where they might wind up hurt or injured or scarred or have a chance of dying. They are guaranteed to lose their lives in the process. There is no coming back from it. For Crais, it’s a final act of redemption for all that he’s done (although there’s admittedly a bit of vengeance against Scorpius mixed in there also), and for Talyn, it’s a hero’s death, and one that allows him to save his mother… but its also fully an act made by a Leviathan. His weapons are all offline, and effectively, the Peacekeeper part of him is neutered. He saves the day as a Leviathan, not as a heavily armed hybrid. It’s entirely possible that this is the first time he feels “right”, with his conflicting side quieted, which may have made the decision, if not easier, possibly more genuine. Crais and Talyn are gone. Completely. It’s a fitting endcap for their arc. Crais is now fully redeemed, and Talyn is at peace. But damn if I won’t miss them terribly. And then we have Crichton and Scorpius. It’s been a constant game of cat and mouse between the two since they met, and thanks to Crais, John finally out-maneuvers him for what would appear to be the final time. As he himself said last episode, he’s become infamous for making really stupid decisions when backed into a corner, and Scorpius has pushed him to that point. It’s not enough for him anymore to just give Scorpius a false lead or let Grayza shut down the project. He needs that last bit of finality to make damn sure Scorpius has lost the research in its entirety. I love the game he plays against Harvey in his head while trying to work out exactly what he’s going to do. At the time, what he’s proposing is a near-impossiblity, and that fact along with his strained mental state is highlighted beautifully by losing game after game against Harvey. It’s only one example of an amazing usage of imagery in this episode. On the subject of Harvey, I love how different he’s become as well, especially compared to the one the other Crichton had. Prior to this, John losing games to him would have possibly meant more. Past Harvey, even when neutered, was much more menacing, but the one we have now has become such a cartoon character that it’s not threatening in the slightest. Harvey’s goal changed completely into one of survival, and surviving in John’s brain (especially this John’s brain) has meant adapting to his surroundings. He’s not looking to torment John, or to snag the upper hand. He’s just having fun. I’m really impressed by the carrier’s destruction, particularly Scorpius’ scenes during it. 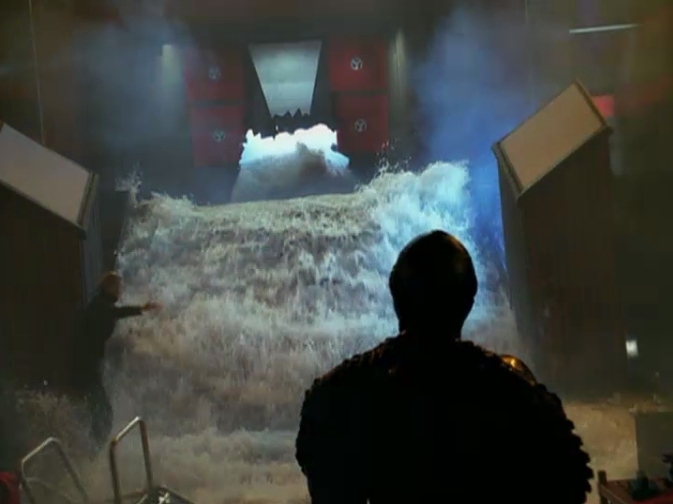 Once its sunk in what’s happening, and he’s accepted the fact that he’s been utterly defeated, Scorpius’ calm walk up the stairs as water comes rushing down is very evocative of a captain making the decision to go down with his sinking ship. His final stand off with Crichton has no menace behind it, and that somehow makes it all the more powerful. This was never about John for him. He even reveals the threat of destroying Earth to be a bluff. It’s not worth the 60 year trip to destroy what he considers an insignificant planet simply for revenge against John. It’s a wasted effort on his part. John was never who he wanted revenge against in the first place. At the beginning of the last episode, he makes a comment that the rift between the two has been breached. During this last scene, what separates them? A rift of flame. John almost makes the effort to try to save Scorpius, but it seems clear that Scorpius no longer cares. Everything he’s been working for has just been wiped out, and as far as he’s concerned, without said work the Scarrans are destined to win. It’s not a future he particularly wants to see come to fruition. Does this mean Scorpius is dead? Possibly, but we’ve seen him go through certain-death situations before and come out unscathed, and this is very much a case of “there’s no body to prove anything”. If he is gone for real, it’s a powerful ending to his story, but there’s room for him to come back if they aren’t quite done with him yet. It would, however, appear to mean that his adversarial relationship with John is at its end. There’s no reason for the two to be at odds anymore. I agree with Noel that not only could the season have ended satisfactorily here, but the entire series could have and it wouldn’t feel abrupt. And yet we still have one more episode to this season. This is the story of a young man who has no idea how sheltered his life is until he is removed from his surroundings and finds himself out in the Big Galaxy. He quickly comes up against opposition, often simply because of who and what he is in an unfamiliar society, but holds to his convictions as tightly as he can, because those convictions are in many ways all he has left. It’s a good thing, too, because he constantly comes up against the worst possible enemies he can have. Ruthless and tyrannical despots, insane probaktos who babble incomprehensibly, and – most frighteningly of all – an incredibly intelligent, quick-witted idealist who believes, fervently believes without a doubt, that his own cause is the right course of action and will do anything to remove the obstacles from his path. There have been several encounters with this most dangerous enemy thus far, each one setting our hero back far enough to rework his entire plan to account for the difficulties. Regardless, our hero plods on, surrounding himself with people who can help him with his ultimate goals, bartering and bargaining and causing general mayhem. He’s acclimated himself well to his new surroundings, and has made quite a name for himself while doing it. And, truth be told, he looks good in his new leathers. John Crichton? Hell no, son. I was talking about Scorpius. The others have done fantastic jobs eugooglizing Crais and Talyn, and Scorpius’s dramatic defeat, so I’ll swing my crosshairs over to the underlying plot thread of the season’s story-arc. As I’ve mentioned before (and punctuated above), Crichton and Scorpius are far more similar than Crichton would ever admit to; Scorpius’s comment last episode of rifts being breached wasn’t simply hyperbole. And let’s not forget that for about two years now, Crichton’s had a Scorpius in his head, whispering and cajoling and threatening, even if Harvey is now simply a cartoonish conscience-analog. Crichton’s been changing ever since getting the brain chip, though – we’ve all noticed it. He’s gotten more ruthless, more focused, more driven in his pursuits, and he’s been getting a lot more coldly analytical. It also bears mentioning that Scorpius is – for a lack of a better term – far more human of a character than his original appearance would lead us to believe. He feels. He hopes. He shares a shockingly honest and touching moment of wonder when traveling through the wormhole with Crichton, both of them forgetting – if only for a moment – the why and simply basking in the glory of what is. And then they return to the Command Carrier, and he finds out that John has once again pulled the rug out from underneath him, destroying both his research and his reason for existence in one fell swoop. Something he knew Crichton was trying to do from Word One and had taken painstaking precautions to prevent. Under the circumstances, Scorpius had been shockingly nice. It’s exceptionally telling that, when the chips were down and the Carrier was exploding, Crichton offered Scorpius the chance to escape with him. Asylum on Moya – or at least, respectful imprisonment. Crichton’s increasing similarities and respect for Scorpius is something that he had been struggling with for almost the entire season. Both of him, actually, and while one Crichton succeeded in keeping them seperate, this one is capitulating. Crichton had won, but he had made peace with his inner Scorpy; why shouldn’t he make some sort of peace with the external one? As rivals get, they were the most equally matched, and you have to respect someone who plays the game as well as you. No, I couldn’t wait ONE WHOLE EPISODE to use the term “Commandant Cleavage”. I still stand by my decision and would do it again in a heartbeat. One thing that really struck me was how quick Crichton was to use the Aurora Chair on Not-Morn – especially for someone who swore never to go back in there himself. I choose to view it as Crichton not only recognizing the gravity of the situation – a willing sacrifice makes you think, after all – but finally accepting the ruthless part of himself that Harvey had been cultivating for years. It was just as much of an Ends Justify moment as it was a Heroic Sacrifice moment, and Crichton is aware of both. It strikes me that, for a Sebacean, being burned to death is an exceptionally horrifying way to go. Like a Hynerian being suffocated by mud, or an Andalite being slowly crushed by a slowly-advancing ceiling, or a Megasharktopus drowning in air on dry land. Goddammit, I complain about not being able to fit a Portal 2 reference into my bit during the back-and-forth emailing for this one, and Kevin not only fits in the smashy spike plate thing I wanted to use but adds another on top of it. I bow to your superior referential skills, sir.